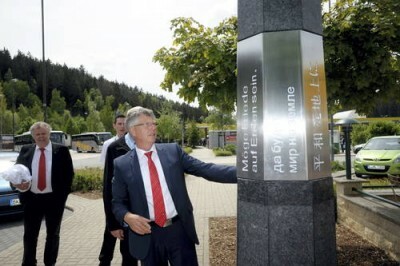 The Peace Pole was planted on May 19th 2015, at a service station on the highway in Munich-Berlin. It is the Hirschberg-Marchè station right on the border between former “East“ and “West“ Germany. This Peace Pole is special and unique, because the metal plate ( bears the peace message) contains a center pivot, that allows it to swivel, to view the 8 language translations ( Dutch, Chinese, English, French, Russian, Portuguese, Spanish and Japanese). This magnificent Peace Pole is constructed from slate and granite with an electrical wire through it, to illuminate it at night. 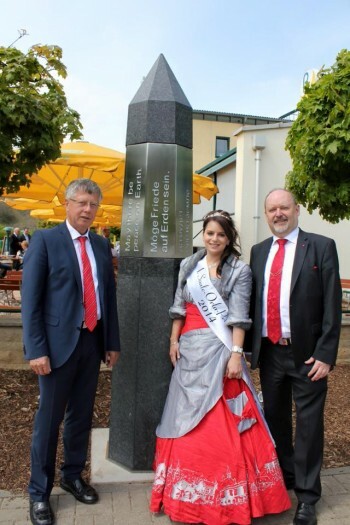 Mr. Schmit, CEO of the Loan and Savings Bank has already financed 3 other special Peace Poles in that region of Germany (Saale Orla Kreis). Spreading the peace message is a meaningful endeavor for Mr. Schmit. It is now possible that the truck and bus drivers from many countries can be inspired by the peace message “May Peace Prevail on Earth“ which they can read in 8 languages before they enter the restaurant and shop of the service station.